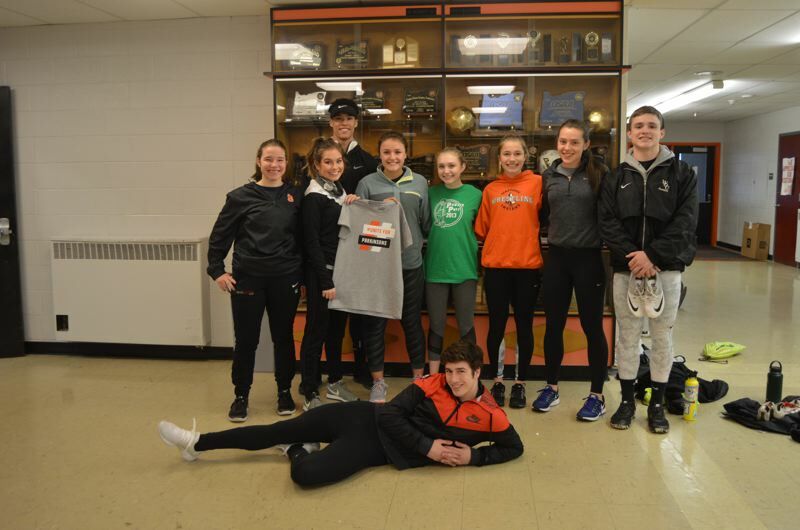 Students from the Scappoose High School track team are hosting a jog-a-thon fundraiser and student-versus-staff basketball game next week to raise money for Parkinson's disease research. The team will be hosting a public "Hoops for Hope" basketball game Friday, March 9, at 6 p.m. in addition to collecting pledges for a jog-a-thon track athletes will take part in after the fundraiser. Alyssa Baird, a Scappoose High School student and athlete on the track team, organized the event to raise money for a cause that is personal to her. Her grandpa was diagnosed with Parkinson's disease earlier this year, and Baird said she knows many staff at the school and in the community also have family members and loved ones who have battled the disease. "We're really hoping it will be a big community event," Baird said. Parkinson's disease is a degenerative neurological disease that can cause tremors and difficulty moving. With the help of her track coach, David Harley, Baird planned the fundraiser and began to spread the word about the event with posters, social media outreach, and door-to-door visits in the community to collect pledges for the jog-a-thon. Harley said he was glad to support some of his student athletes in the planning effort. "I have always thought of having some kind or community service or awareness as something to possibly give our athletes a perspective on things around them that extend beyond the sport itself and allow them the opportunity to participate in something 'bigger' than themselves," Harley stated in an email. "Alyssa came to me with this idea and I supported it (and her!) quickly and wholeheartedly." Each track team member has been soliciting pledges and the team has been trying to fundraise as a whole. Depending on the total dollar amount raised, the team will determine how many laps it will run. While it doesn't have a specific fundraising goal set just yet, Baird said the team has been working hard to spread the word about its efforts. In addition to the jog-a-thon, the track team will sell t-shirts and host a "Hoops for Hopes" basketball game that will pit a student athlete team against staff on Friday, March 9, at 6 p.m. Tickets are $4 each and t-shirts will be sold for $15 and include free entrance to the game. A school dance for students will follow the game as an additional fundraising opportunity. Baird said she is looking forward to attending the game with her grandpa, who is a huge fan of basketball, she said. The fundraiser will be a great opportunity for her family to all be together, she added.